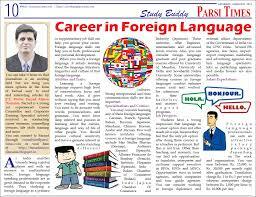 Career in foreign Language Courses : India is a country where you can find great career in foreign language. Any foreign language profile is given high important in the society. Coming to the profession, languages such as french, German, Spanish, Korean, Japanese etc are of high demand in any corporate organisation. Most of the MNCs look for these kind of people who have knowledge in several foreign languages to communicate with their clients from different countries. So, learn any foreign language to make a great career. 2. Various jobs come under this foreign language translator profile, some of them are tour operators, translators, interpreters, decoders, online content writers etc. An interpreter must possess sound knowledge of the foreign language as they need to communicate information from one language to other. As far the translator is concerned, he/she must have excellent writing skills in language as they need to translate numerous written documents regularly. Indian companies who have joint ventures with other foreign countries or the MNCs that are coming to India after long time are the companies that prefer these kind of foreign language translators or interpreters. 3. So, if you have done any professional course in foreign languages, you can join the career in public relation, diplomatic services, publishing houses, mass communication, tourism, BPO’s, embassies, entertainment industry and international organizations. You may have an option of teaching in abroad. You can become a EFL teacher abroad if you teach English language in foreign countries. As you know that English is an Universal language, it has huge demand all over the world. Apart from technical industries, English language plays a vital role in business as well. 4. List of some of the best foreign language teaching institute in India.